A supposedly leaked design sketch of the second-generation Kia Cerato/Forte sedan has been making its rounds on the Internet. 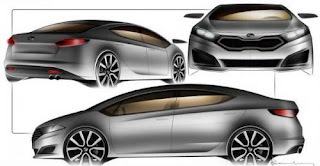 The rendering shows the next Cerato/Forte sedan to have lines and design characters inspired by both the smaller Rio and the larger Optima models. The C-segment sedan will launch sometime in 2013, followed by a five-door hatchback a year later.